I felt the need to share this article again as many dog owners and some dog trainer’s are not familiar with the Best way to train a dog. It was in the September of 2000 that the first version of this article appeared in Paw Prints, the Green Acres Kennel Shop newsletter. I have updated the article ten years later because sadly there are still too many people, some of them animal professionals, and some who try to play the part on TV, promulgating the dominance myth. If you attended a dog training class anytime through the 1990’s, if you read any dog training books written during this period, or if you have had any behavioral issues with your dog, then you have most likely heard about dominance. You were probably told that in order to prevent your dog from becoming dominant that you had to: 1) always go through doorways first, 2) always eat before your dog, 3) never allow the dog on furniture where they might be elevated above you, 4) never allow the dog to sleep on your bed, 5) always punish your dog for stealing or chewing things that belong to you, 6) push your dog away when they jump up or paw at you, and 7) never let your dog pull on leash. Essentially you were told that you had to be ever vigilant and that you had to do whatever it takes to show your dog that you were the boss in order to prevent him from taking over your home and becoming disobedient and even possibly aggressive. The concept of the dominant dog was based on a model of how wolves interact socially within a group. The wolves being studied were described as having a strict, force-based hierarchical structure where one male and one female were always the dominant ones in the group. These dominant wolves had first access to the resources necessary for survival: food, water, and a mate, and fought to maintain this access. The other wolves in the pack were constantly challenging the alphas so that they could take their position and have access to the resources. Someone then extrapolated that since wolves and dogs are biologically the same species, dogs must also be struggling for dominance amongst each other and with us, and that this drive to be dominant is why dogs are disobedient and may even become aggressive. This idea that dogs were striving to be the alphas over us resulted in the recommendation that we must always be dominant over our dogs and that the best way to do that is to use physical and mental intimidation, just like the captive wolves used with another. This philosophy was captured in a popular book of the 1970’s, How to Be Your Dogs Best Friend, by the Monks of New Skete. The Monks include detailed instructions for physically disciplining your dog. They recommended hitting your dog hard enough under the chin so that it hurts and shaking the dog by the scruff of their neck while yelling at them. The Monk’s described something they called the alpha-wolf roll-over as the ultimate punishment for the most severe disobedience. This involves grabbing the dog by the scruff of their neck and firmly and rapidly rolling the dog on its back and pinning it while making eye contact and yelling at the dog. In their book the Monks asserted that these disciplinary techniques are what a mother wolf would use in the wild to discipline her pups. My first personal experience with the alpha-wolf roll-over occurred in the very first dog training class that I attended. Paula and I were taking our new Cairn Terrier puppy to a dog training class based on the recommendation of our veterinarian. We knew nothing about training dogs and assumed that the people teaching the class did. Gus was approximately 12 weeks of age and had no prior training. It was the very first night of class and ALL the puppies were expected to sit on command. When Gus would not sit, the instructor told me I had to show him who was boss and make him sit, and if he still wouldn’t do it, then I should alpha roll him. Well Gus wouldn’t sit (I know now he had no clue what I was even asking for) and so I was told to “roll him!” I soon had a terrified (unknown to or disregarded by everyone) Gus, flat on his back, pinned to the floor, eyes rolling, body writhing, mouth growling and snapping at everything. The instructor was really adamant now: “We can’t have that! Grab his muzzle and clamp it shut!” My instincts said “Whoa! That’s not safe!” but these people were the “experts” so I grabbed Gus’ muzzle in my hand. Instantly, I felt his canines puncture my palm as my blood started dripping on the floor. Gus broke free and moved as far away from me as he could. There is something to be said for listening to your gut instincts. Gus listened to his. I failed to listen to mine. Unbeknownst to me at the time, everything that I had read and been taught about the Alpha Wolf Roll-Over was based upon flawed knowledge. My puppy was afraid for his life and it was my fault. The wolves being studied that resulted in the conception of the dominance construct were not a pack of wolves living in the wild but were in fact a mixed non-familial group of wolves living in a fenced enclosure with far less resources than what would be available in the wild. This was not a normal wolf pack nor were these wolves in a typical environment. We now know that true wolf packs, living in the wild, do NOT have a strict, force-based hierarchical structure. In Alpha Status, Dominance, and Division of Labor in Wolf Packs, biologist L. D. Mech notes “… in natural wolf packs, the alpha male or female are merely the breeding animals, the parents of the pack, and dominance contests with other wolves are rare, if they exist at all. During my 13 summers observing the Ellesmere Island pack, I saw none.” What Mech observed was a family of wolves: a breeding pair, pups and possibly some of last year’s pups. The breeding pair provides for and raises the young until such time that they move on to start their own pack and families. 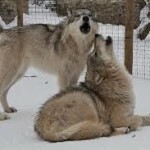 This is how a typical wolf pack in the wild interacts. In order to survive they must work together. If they were constantly fighting one another they would not live to reproduce. 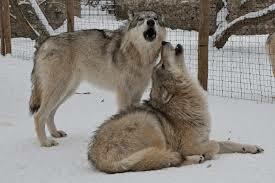 While we know that wolves and dogs are biologically the same, we also know that behaviorally they are very different. On page 24 in the book Dogs, evolutionary biologist Dr. Raymond Coppinger states: “Dogs may well be closely related to wolves but that does not mean they behave like wolves. People are closely related to chimps but that doesn’t make us a subspecies of chimpanzees. Nor does it mean we behave like chimps.” Coppinger goes on to explain some of the differences between dogs and wolves: 1) dogs are not as quick at learning and have poor problem solving skills, 2) dogs have smaller brains, 3) dogs are easily tamed, 4) dogs are better scavengers, and 5) even when feral, dogs do not have a pack structure. As Coppinger states on page 67: “I don’t think a dog knows what people are talking about when they exhibit this “alpha wolf” behavior. Dogs do not understand such behaviors because the village dogs didn’t have a pack structure; they were semi solitary animals.” “In fact, contrary to popular belief, dog’s around the world do not (or only rarely) exhibit ‘pack’ behavior.” Coppinger’s observations are made based on his study of dogs throughout the world. As for Gus and me, I do not really remember much of what happened next other than being offered ice for my hand as Paula worked with Gus for the remainder of the class. In fact, Gus and I were rather wary of each other for quite some time and I let Paula take him to the rest of his classes for the next couple of years. Over time and lots of games of tennis ball, Gus and I learned to trust one another again and started having fun. As I started to learn more about dogs I discovered that there were far better ways to train a dog than with fear and intimidation and trying to be dominant. So, if my dog Is not dominant, why does he misbehave? Unrealistic expectations – Many people expect dogs to be furry little people with human values and morals. They do not like that dogs exhibit normal canine behaviors such as mounting other dogs, sniffing dog butts, and jumping up on people, just to name a few. Some of the behaviors we find undesirable are perfectly normal for a canine. To not accept these behaviors is simply unrealistic. However, if we find a behavior such as mounting undesirable, we can easily teach our dog a behavior such as “off,” which gives them something else to do, which is mutually exclusive to mounting. For some illogical reason people expect a dog to always comply with every command they give. How many people do you do know that always do everything they are told to do? Failure to manage the dog and its environment – Every dog has at least two trainers; its guardian and the environment in which it lives. The typical guardian probably spends less than an hour per day actively training their dog while the environment is working 24 hours a day seven days a week. Therefore, part of training any dog needs to be the proactive and intelligent management of the environment in which the dog lives. 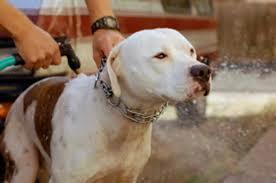 For example, dogs are scavengers and are always looking for food. If your dog steals a steak off the countertop it is not because they are trying to become dominant, it is because we left the steak somewhere the dog could get and then left the dog alone in that room. Instead, we need to take advantage of the fact that we are smarter than the dog manage the environment to prevent undesirable behaviors. If a dog is successful in a behavior, it will be repeated, not because it is dominant but because it has learned the behavior is rewarding. Failure to train the dog – Too few people take the time to take their dog through at least one training class. These people often end up with a dog that has “issues” and is then labeled “dominant”. 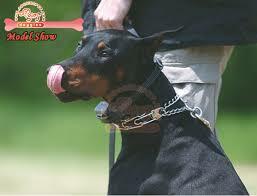 Every dog needs to be trained and training needs to continue throughout the dog’s life. The best way to train any animal, dog or human, is by rewarding them for the behaviors we like and managing their environment to prevent behaviors we do not like. 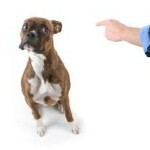 Unintentional training – Many people do not realize that they are rewarding the dog for the behaviors they do not like. Chasing the dog when he steals a sock rewards the dog for stealing, pushing him off when he jumps up rewards him for jumping, and letting him go forward with the leash tight is rewarding him for pulling on leash. 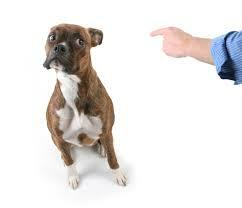 We cannot blame the dog when we reward these undesirable behaviors. 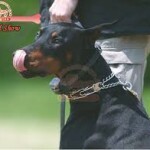 Allowing the dog to train you – A lot of “dominance” issues involve dogs that have essentially become spoiled brats. Their guardians have not taken the time to learn about dogs but instead treat the dog as if it were a furry child, allowing the dog to train them. Dogs do what works, and if they find they can stay on the couch by growling or get attention by pawing at you, then that is what they are going to do. These dogs are not dominant; they have quite simply done a very effective job of training you, instead of you training them. Physical Punishment – People who choose to train their dog with physical punishment are more likely to see “dominant” like behaviors such as growling, because they put their dog in a position of fearing for their safety. Tools such as shock collars, prong collars and choke collars are designed to cause pain which often results in the dog becoming fearful. 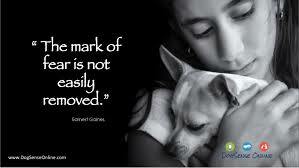 When your dog is afraid or feels pain he will respond accordingly, and that response may be aggressive in nature. Rather than rewarding desirable behaviors, these people focus on punishing for undesirable behaviors and in so doing create a dog that is always on the defensive and afraid that making the wrong choice will cause pain. Failure to meet the dog’s needs – A common reason for undesirable behaviors in dogs is our failure to meet the dog’s most basic needs including physical exercise and mental stimulation. Stealing a sock or your underwear is a great way for the dog to get the attention from you he wants and needs. To a dog, it can be very rewarding to be chased and yelled at, especially if this is the only exercise their guardian provides. Emotional issues – In my experience most aggressive behavior by dogs is not due to “dominance” but is due to an emotional reaction, fear and anger being the most typical. A dog that is afraid is a dog under stress and like a person under severe stress can react very irrationally and if they feel threatened very forcefully. Sadly there are still trainers that tell people to punish their dogs for growling or advise them to force the dog into a sit-stay and allow people to pet it until the dog becomes comfortable. This would be akin to taking a person afraid of snakes and tying them in a chair and allowing snakes to crawl all over them. This approach is certainly not humane and is more likely to make the fear worse. Dogs with emotional issues can be helped, but a training class is usually not the answer. Undesirable behaviors in dogs that are attributed to “dominance” are not due to a pack driven instinct of the dog, but rather are due to our failure to take responsibility for the dog’s needs, and to properly, humanely train ourselves and our dog. If a dog is “dominant” it’s because we have trained them to be so. Strive to be good guardians and provide your dogs with everything they need, including food, water, shelter, training, mental stimulation, physical exercise and common sense management. Then they will not learn the undesirable behaviors that in the past have been erroneously attributed to dominance. Originally published in Green Acres Kennel Shop Paw Prints, September 2002. Stress in Dogs,Martina Scholz and Clarissa von Reinhardt, Dogwise Publishing, 2007.